You can find more blog posts here. Helminthic therapy, sometimes referred to more casually as worm therapy, or confusingly as helminth therapy*, involves the administration of controlled numbers of benign intestinal helminths, or roundworms, such as hookworm and whipworm. 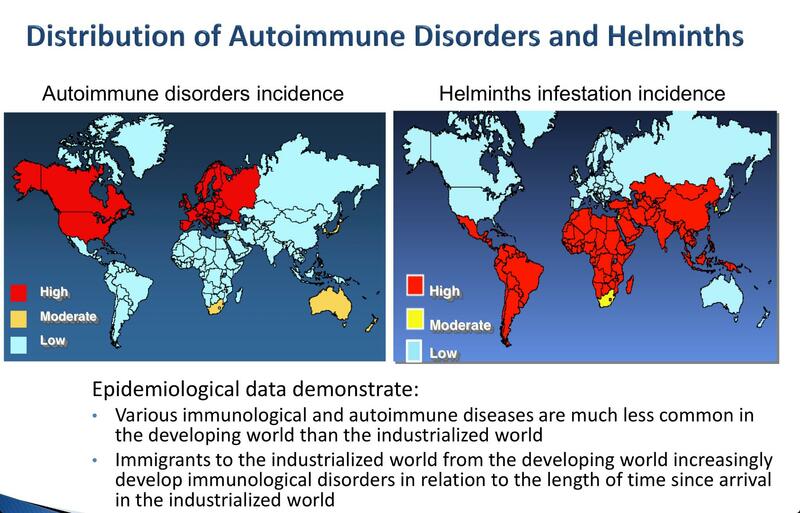 Helminthic therapy is a type of immunotherapy, it is an approach to the treatment of chronic inflammatory disorders, autoimmune diseases, and immunological disorders that do not fit the formal, and very narrow definition of autoimmunity. Helminthic therapy came out of research into the impact of parasites generally, and helminths increasingly specifically, on host immune response. Helminthic therapy is an attempt to modulate the inflammatory response, and learned immune response by remediating the ecosystem defined by our bodies, and arose out of the hygiene hypothesis and old friends hypothesis. These theories postulated that humans evolved with, and depended upon microbes and helminths being present in our bodies throughout life for a properly trained and regulated immune system. Helminths were quickly identified as likely having a large role because of their relative complexity, and their complex interaction with, and control over, their host’s immune system. Helminths down regulate the inflammatory and wider immune response directed at them by human hosts in order to avoid destruction by host immunity, with the happy result that inflammatory responses are reduced in terms of their variety of causation, frequency, and severity. The treatment was developed based on an understanding gained from scientific studies showing that, while these illnesses have escalated in developed countries during the past 50-125 years, they remain much less common in parts of the world where intestinal worms are still prevalent. The idea of reintroducing helminths in an attempt to restore health is one that occurred widely and simultaneously in the 1990s if not before. In fact the first instance of someone losing their seasonal allergies was documented in 1976 in the Lancet by Turton along with the observation that this approach could lead to the control of allergy. Helminthic therapy came about in the context of the hygiene hypothesis, which proposes that the immune system develops and is trained properly by exposure to a quantity and variety of benign infectious organisms in youth. A process that has been eliminated in the developed world and lost due to improved hygiene, sanitation and lifestyle changes. The organisms that are used have coevolved with us (the old friends hypothesis) to become masters of the human immune system over many thousands of years of coexistence with man, and many more millenium of coevolution with our genetic forebears. It has been demonstrated for instance that portions of our immune system have been shaped if not created by co evolution with helminths in particular, down to the nature and characteristics of several major and important cytokines, like various interleukins. Helminthic therapy produces a therapeutic response for most people who do respond within three to six months, with ongoing improvements for at least three years. However many do not show a response until 18-24 months after the administration of the first dose, again followed by gradual improvements in the following year. While most diseases respond with a marked change in symptoms, others display a very gradual, incremental response. It should be noted that not all those who use helminthic therapy show an improvement, and unfortunately it is not yet possible to predict those for whom helminthic therapy will provide no benefits. Helminthic Therapy A brief introduction from Wikipedia. Helminthic Therapy Success Stories A list of over 300 accounts of success using helminthic therapy with more than 60 different medical conditions. Helminthic Therapy FAQ Answers to frequently asked questions. Don’t Let Worms Give You The Squirms For those who are interested in helminthic therapy but have an aversion to worms. Hookworm Timeline A timeline showing what to expect after inoculating with hookworm. Reconstituting the depleted biome to prevent immune disorders An article explaining why replacing our “old friends” may be the only reasonable therapy for a wide range of immune-associated disorders, including allergy, autoimmunity and autism. Helminth–host immunological interactions: prevention and control of immune-mediated diseases An excellent summary of the science underpinning helminthic therapy. The above two articles would be ideal to give to a doctor who is interested in helminthic therapy but lacking information. Helminthic Therapy Science Readings A collection of links to 60 articles reflecting some of the medical science pertaining to helminthic therapy. Yahoo Helminthic Therapy forum This has more than 1,100 members and a searchable archive of over 9,000 posts. Facebook Helminthic Therapy Support group This is the most active HT forum. Click on the “Join Group” button to request membership. Pinterest Helminthic Therapy pinboard This features hundreds of research and news articles about helminth therapy, gut health and their relationship with autoimmune diseases. Disclaimer: This post is not intended to provide medical advice, diagnosis or treatment. *Helminth therapy has traditionally been defined as the treatment of an undesired helminth infection involving administration of anti helminthic drugs, like albendazole or mebendazole, that kill helminths. For instance those used in helminthic therapy: hookworm or whipworm.